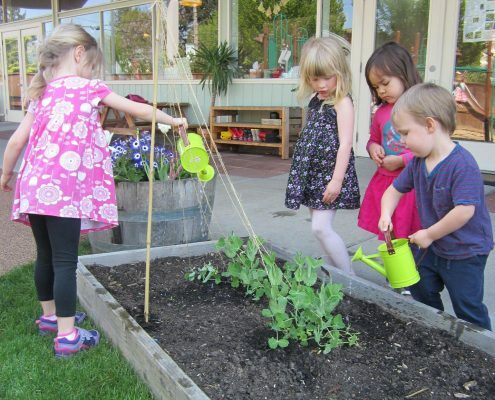 Montessori of Alameda is based on the philosophy of Maria Montessori. Our environment is enriched by current research in early childhood development, conflict resolution and psychology. We believe that every child is born a unique individual. We are trained as Montessori teachers committed to individuals to observe each child’s behavior, interests and to prepare our classrooms so they reflect each individual’s tendencies and needs. We believe parents are the most significant adults in a child’s life. We strive to create a partnership with each family to create a positive environment for each child. We want to create a learning environment for parents as well as children and be a resource to the families who attend our school. When children are involved in a supportive, success oriented community, they learn to take responsibility for themselves as individuals, and are sensitive to their own needs and those of others. We believe that we are all part of a world community. We strive to encourage our children to strengthen their own cultural diversity and to appreciate each individual’s strengths and differences. We are committed to respect for our natural environment. We believe our children are key players in the earth’s future. We encourage knowledge and respect for the earth and it’s creatures, no matter how small. We practice positive discipline. We establish appropriate limits to help each child function in his/her world. Our programs are designed to provide each child with a sense of independence and responsibility. We aim to create a community where children can observe and practice social skills, conflict resolution and a building of community.